In general, kittens can be described as young cats under the age of 12 months or 1 year old. Like adult cats, kittens will vary in size. The most important thing to remember is that a kitten is still a kitten regardless of it’s size. This means that their development is relatively the same. A big kitten is no indication that it is fully developed even if she has stopped growing. Their brains, bones muscles, motor skills, etc. still have much growth to accomplish. 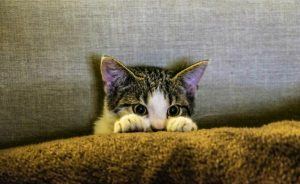 Want Exclusive Tips and DIY Projects To Keep Your Cat’s Claws Happily Off Your Furniture? Now I hope I’m not scaring you. I just want to properly inform you about the things that can occur when certain variables are not taken into consideration. Despite their inability to take a heavy impact (or any impacts depending on the age of the kittens) they still need much of the same things as cats such as scratching posts, sleeping spots, hideouts, etc. The biggest difference is that these things must be specific to kittens. I know what you’re probably saying to yourself right now and if you are shame on you! lol, I’m just kidding but on a serious note, I hear so many people talking about ‘how they aren’t gonna do such and such for no animal’, in this case, cats and kittens. If you think this way I challenge you to step outside that narrow mindset for a minute. Would you tell a baby, toddler or small child to lift a 20 lb weight? Can a baby, toddler or small child jump from a wall without hurting themselves? No, of course not. You won’t let your baby, toddler or small child lift a 20 lb weight or jump from a wall without assistance. While it is important for a baby, toddler or small child to be able to lift small weights and eventually learn how to jump, everything happens in small stages. It is the EXACT same with kittens. Please do take this seriously because I don’t want you to be burdened with hundreds and even thousands of dollars in vet bills, meds, etc. I couldn’t even imagine how much it would cost. It cost about a thousand dollars to take care of my dog’s worm infection let alone broken bones, multiple visits and all of that jazz. Spending a hundred or so dollars is worth the investment. An ounce of prevention is worth a pound of cure. Kitten furniture should be low to the ground but sturdy. It should resemble the same as a cat condo or tree just in miniature form. Being it is lower to the ground does not mean that it should be less quality or insecure. It should be well balanced so that it does not fall on your cat, you or any other member of your household. 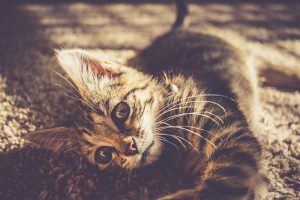 While the actual setup can be adjusted to your kitten’s, your’s or a combination of both’s specific preferences, there are certain things you need in place to keep your kittens happily entertained. Like most pets, kittens will get bored of playing with the same thing, so having a variety and rotating toys will keep them occupied. I hope this information has helped you to see how important it is for kittens to have the right furniture. The good news is that as adults, they can still use them so you will only need to buy a couple of extra things. If you have any questions, comments or other feedback please do not hesitate to leave them in the comments box below. See you next time! Click here to learn more about the best cat trees for kittens! I really enjoyed this article it was very enlightening. I never want to cause any harm to any animal so I’m happy that you added the injuries that a kitten could get without the proper home set up. Many things you said I really wasn’t aware or I didn’t really think about and I’m kind of feeling neglectful right now. I have three cats. They range in age from 1 year to 3 years old. We have a tall cat tree and I have lost count of how many people are surprised that the cats actually use it. They were 6 months,7 months and a year old when I adopted them. It never occurred to me that they needed a shorter tree until they got older so I am glad we never had any injuries. Thank you for sharing this information. Most people think that cat trees are a one size fits all but they’re not. Most people struggle to find cat trees for their cats because they either don’t or don’t know they should consider their cat’s preferences. This is why there are so many variations of cat trees, toys, posts, and other cat climbing structures out there. I know how much experimenting can add up as I have not only cats but other pets as well including exotic pets like hermit crabs but its a necessary part of keeping our pets healthy and happy! Doing this will keep all parties in good moods which will reduce unwanted behaviors like aggression, furniture damage, boredom, fighting, injuries and so much more!